With the release of 11.1.2 comes an overhaul of the workflow process, there has been much criticism in the past of how rigid the process had to be and it was severely lacking in anything but basic functionality. Oracle have taken onboard this outcry and started to invest development into enhancing workflow, now the aim of this post is not to explain the how workflow operates but to look at the different options for managing planning unit hierarchies. Prior to 11.1.2 the workflow process had a basic configuration where planning units were defined by a combination of entity, scenario and version and the promotional path was purely based on how the entity hierarchy rolled up. 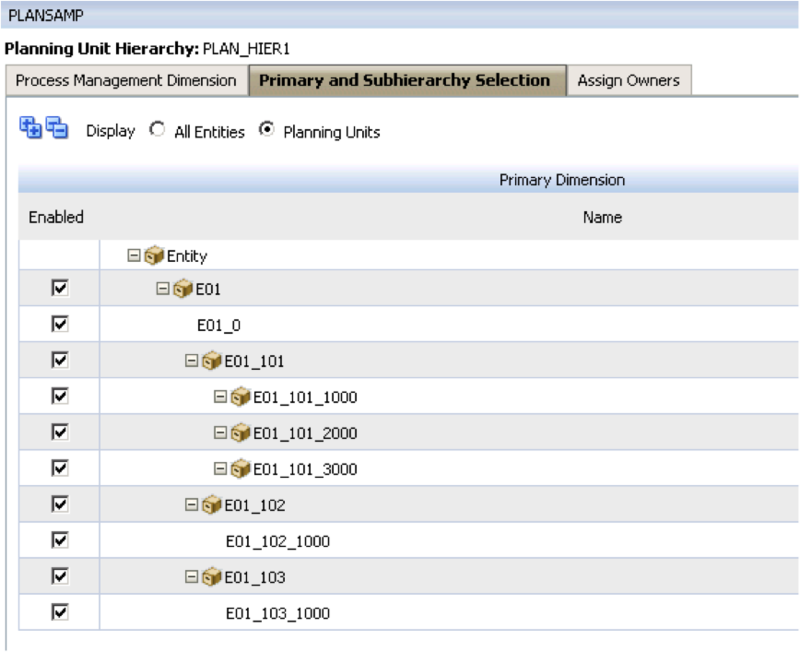 From 11.1.2 a planning unit can be based upon on entity and a secondary dimension, the promotional path & email notification can also be defined, this configuration is known as a planning unit hierarchy and multiple hierarchies can be created per planning application, each hierarchy can then be applied to a scenario and version member. 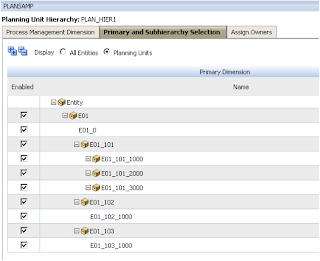 Selecting “Planning Unit Hierarchy” will open up the management area where new planning unit hierarchies can be created, edited, assigned or deleted. First you would give the hierarchy a name and if relevant a description to go with it. Enable Process Management has the following options from the dropdown. 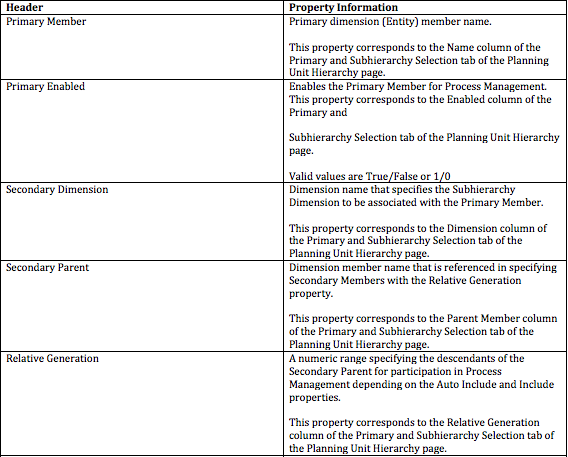 All :- Add all planning units (Entities) to the budget process. 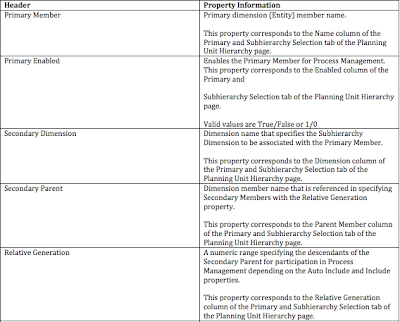 Custom :- Define which planning units to include in the budget process. If you select custom you can add individual planning units based on Parent member and generation criteria. Relative Generation 0-2 will select the member E01 and the two generations below E01. 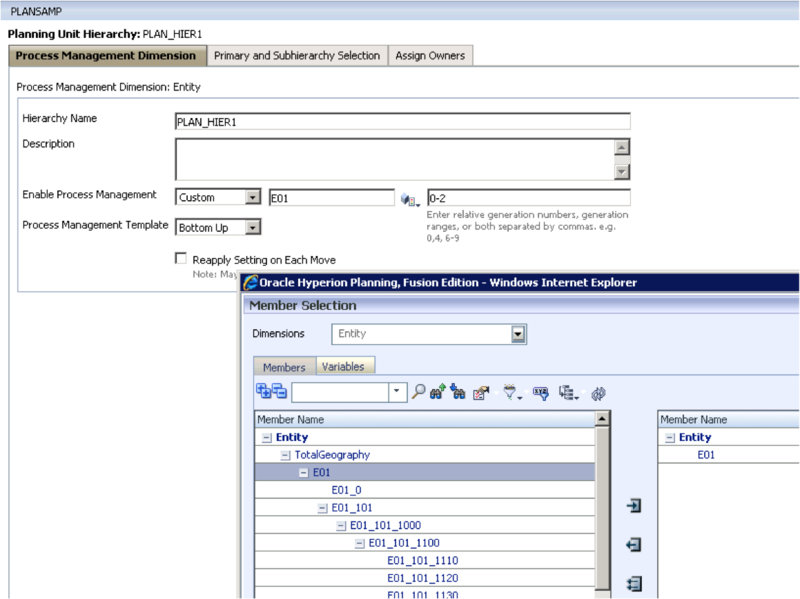 Once selecting the “Planning Units” radio button only the entities defined in the custom selection will be displayed. You can also select planning units by right clicking a member and choosing from the list of functions. Group) and consolidated by rolling data up the organizational hierarchy. 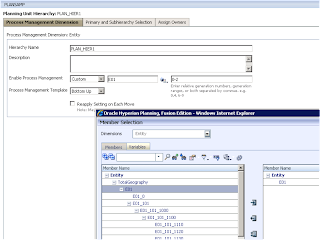 Users can view or edit data based on security defined for the planning unit. Using process management, planning units get reviewed and approved. In distributed budgeting, the budget is defined at the top level of the organization and then data is distributed down the organization hierarchy. Budgets can be distributed by cascading the datadown one level in the organization, or by distributing the data to all organization members. releases earlier than Release 11.1.2.
time it is added. If the entity meets the criteria for inclusion in the budget process, it is marked for process management. If an entity does not meet the criteria, it is excluded from process management. A new feature in 11.1.2 is the ability to select a secondary dimension to base the planning unit on; a secondary dimension can be selected from the dimension dropdown. 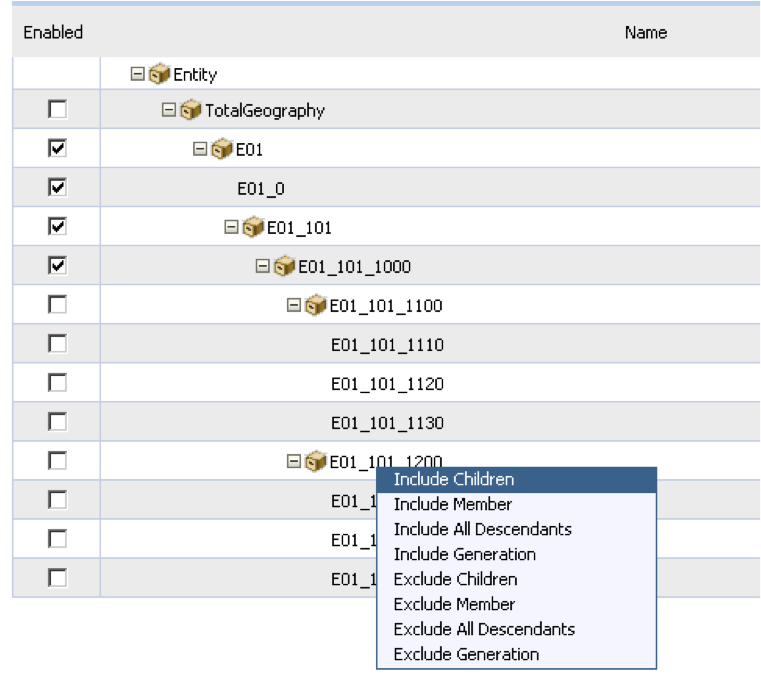 Once a dimension has been selected a parent member is required and then a relative generation, in the example I have selected "HA" and a relative generation of 1, so this any members that are a child of "HA". If the Auto Include is selected it will automatically select all members based on the relative generation (it even counts the number of members and displays in the count box), if it is not selected the members can be selected manually. After completing the subhierarchy definitions the promotional path can defined which is accessed by the “Assign Owners” tab. 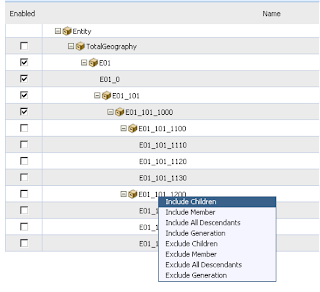 In the above example you will notice that the entity and secondary dimension members are displayed. Planning unit ownership is inherited from the planning unit parents. Planning unit reviewers are also inherited. 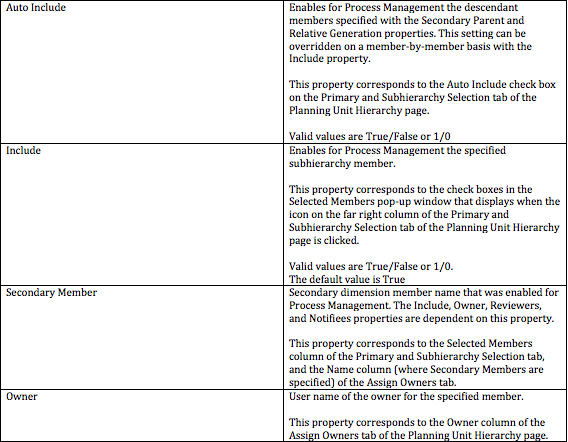 You can also explicitly specify planning unit owners and reviewers to assign owners and reviewers other than those planning units inherit. An owner can be a user, a reviewer can be a user or group and notications can be set to users or groups. As you can imagine if you have a large hierarchy using a secondary dimension and a non standard promotional path then it can be a painful task to manage directly through planning, this leads me on to the reason for this post. 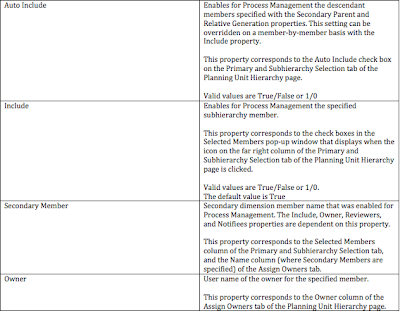 So now we know what each of the column properties are it should be possible to create a planning unit hierarchy template to load into planning. The template has to contain member names and not aliases. I have also included a custom promotional path of Owners and Reviewers. With each of the loading methods a planning unit hierarchy has to already exist so I will quickly create one. Besides naming the hierarchy everything else is left as default, the next step would be to use one of the available methods to load the hierarchy. Well that is where I am going to leave it for Part 1, in Part 2 I will go through loading using Method 1 :- Planning Web. Now I have known about this issue/feature for a long time but recently I have heard a few people mention it and I just wanted to very quickly highlight the problem if you were not aware of it. First of all if you are going to use the essbase adaptor to perform data loads I always recommend using version 10.1.3.5.5 or newer and to use a load rule with the interface. The issue only manifests itself when you are performing a data load with multiple data columns. Let’s take an example in its simplest form. In certain circumstances source data could be across a number of rows, yes you could group this information but sometimes you don’t want to add to existing values, anyway there shouldn’t be an issue loading this type of data into essbase. Loading the data directly into essbase using a standard load rule produces a result that you would expect. Now you will notice the difference, the value for Sales is #Missing and you would expect the value to be 1. When ODI loads data if it encounters an empty cell it treats and loads the value as #Missing to essbase. This would be the equivalent load file if it were directly being loaded into essbase. So is this a bug or just the way ODI requires to load data using the API, I will leave that for you to decide. If you are going to load data in this manner then it is something you need to be aware of, if the data cannot be grouped it is worth considering an alternative approach such as having all the member information in the rows and having one data column.